The Allied observer’s attention is drawn away from the frontline as two black specks fast approaching his hydrogen filled balloon resolve into a Pfalz D.III and a Fokker D.VII. Their machine guns spitting fire, the two German fighters dive onto the balloon as its hapless crew try and winch it down to safety. The observer takes to his parachute just before the envelope explodes in flames. Fleeing from their victory the Germans are set upon by a flight of British S.E.5a scouts seeking revenge. This description could have been of an action over the Western Front in1918, however, in actuality, it took place in Irish skies in 1965. 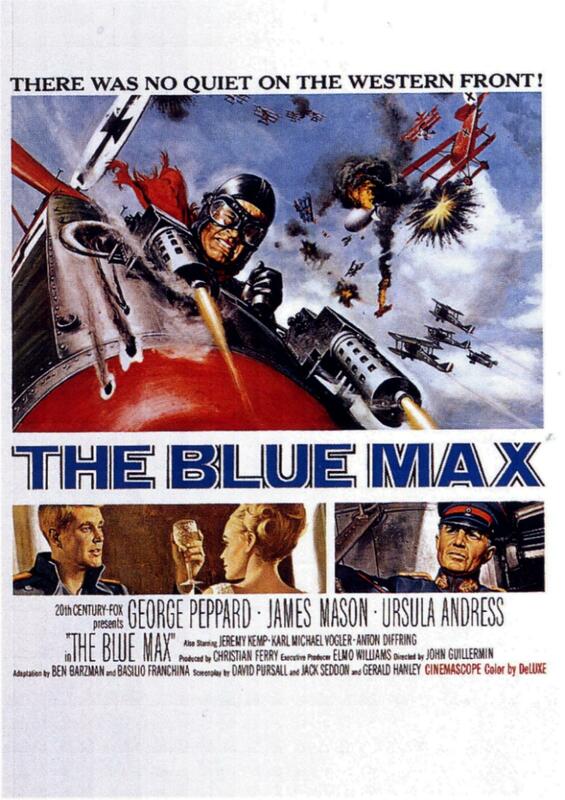 The announcement that 20th Century Fox had purchased the film rights of Jack D Hunter’s “The Blue Max” sent shivers of anticipation through the World War I aviation community. The last Hollywood attempt at a WWI aviation movie was the dismal “Layafette Escadrille” by William Wellman. While including some good scenes of training on Bleriots, this Tab Hunter vehicle borrowed the dog fight sequence from his earlier ”Men with Wings.” The “Blue Max” film was to be a multi-million dollar production with an all star cast. Blond, blue eyed George Peppard played the anti-hero Bruno Stachel. James Mason, Jeremy Kempe and Ursula Andress filled out the star studded cast. The real stars were to be the full sized reproductions of World War I fighters constructed for the film- two Pfalz D.III biplanes, two Fokker Dr.I triplanes, two S.E.5a scouts and three Fokker D.VII biplanes. The aerial sequences were fleshed out with Stampe SV-4C two-seaters converted to single-seat “fighters”. They wore German or British camouflage as appropriate for their scene. 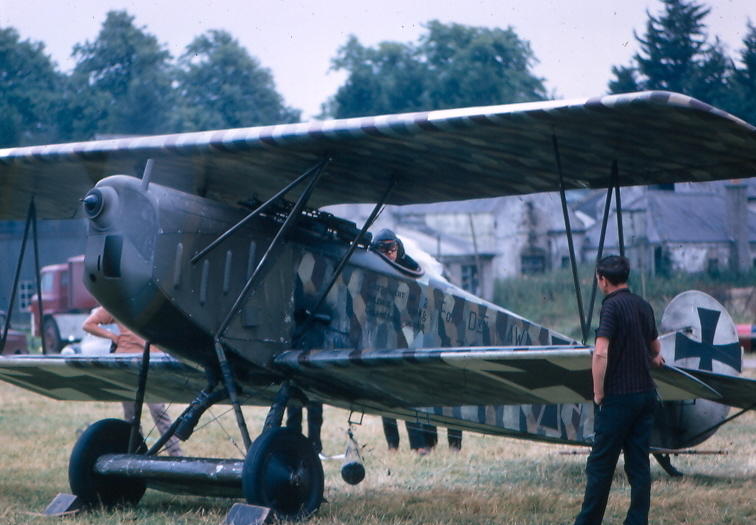 A modified Caudron 276 Luciole was an Allied reconnaissance machine. Mock-ups appeared in the ground scenes and as ”crashed” aircraft. The reproductions had to be built in a hurry to meet the time frame for shooting and were constructed in different locations. Miles Marine and Structural Plastics Ltd of Shorham, constructed the steel tube fuselage S.E.5a reproductions. 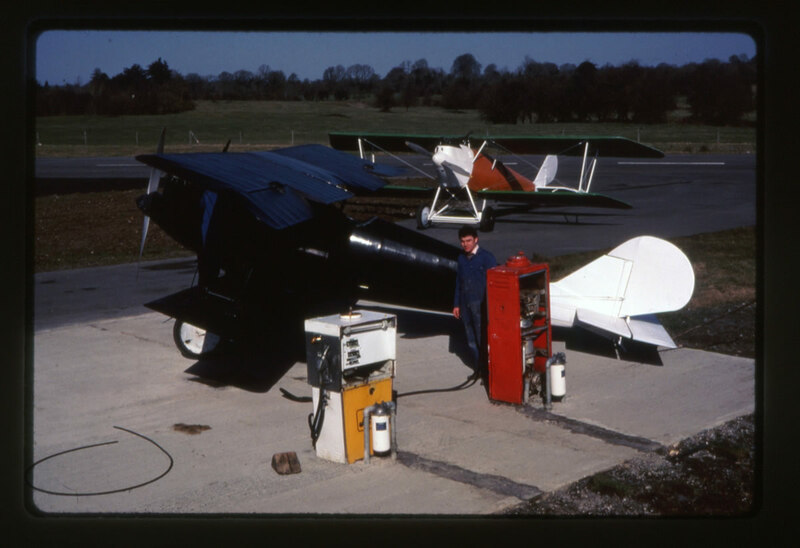 With a 200 hp De Havilland Gypsy Queen 3 engine installed, they were very manoeuvrable and reportedly easy to fly. John Bitz GmbH of Munich built the Dr.I triplanes (G-ATIY and G- ATJM) around Simens radial engines, as a result the machines lack the finesse of the actual Fokker machines. One Pfalz D.III reproduction each was constructed by Personal Plane Services (G-ATIF) and the other by the Hampshire Aero Club (G-ATIG). At Dinard airport in France, Claude Rousseau constructed three Fokker D.VII fighters (F-BNDF to F-BNDH) in six months. At the time it was stated that the machines were constructed to original plans and dimensions. The limited choice of engines led to the Gypsy Queen being also installed in the D.VII reproductions. The Gypsy Queen is a six cylinder in-line inverted air-cooled direct-drive engine, as a result the prop emerges through what would be the radiator shell of a true D.VII. Rousseau Aviation named the reproduction the D.VII-65. The availability of these aircraft would see them appearing in more movies. “Darling Lili” of 1970 was a vehicle for Rock Hudson and Julie Andrews. A musical comedy, it was memorable in one aspect, the building of six S.E.5a reproductions added to the Allies squadron. These were based on the Currie Wot airframe and were referred to as Minis due to their not being full size reproductions. Appearances in “You Can’t Win them All”, “Von Richtofen and Brown” (aka “The Red Baron”), and “Zeppelin”, followed. The latter two movies saw fatal crashes and the aircraft were soon after dispersed to private collections.